Ex-Not Rebecca frontman, Dave Lysien, expands his punk horizons with his band Textbook's latest release "The Great Salt Creek". Recorded live-to-tape by veteran producer John Agnello (Dinosaur Jr., Buffalo Tom, Son Volt, Burning Airlines), the album blasts through 11 tracks of midwestern-power-pop that blends punk, roots-rock, and indie-pop into one classic LP. Fans of Get Up Kids, Wilco, Dashboard Confessional, and The Replacements are sure to enjoy this record, with its great analog production, heartfelt lyrics, pounding drums, and ripping guitar solos. 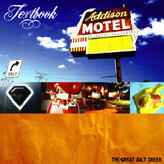 "The Great Salt Creek" will appeal to rock n' roll lovers of any genre. Allison Lysien, John Agnello, Pete and Playing Field Recordings, Aston and Boss Tuneage Records UK, Dan and Gina Knapik, Matt Montalto, Eric Jensen, Jim Kopeny, Matt Allison, Rob Grenoble, Brian Peterson, our families, friends, and you.